Hello, Connie here with you today to share a Special day with you, so glad you stopped in today. I thought this set would be great for all year around because you can color the the flowers for whatever time of year it may be, this would be great for Easter, Summer as I am doing and I am thinking how pretty this would be in Red for Christmas :) You could put a stamped scene in the middle and have the flowers framing it, but today I needed a Birthday card so I went with a stamped sentiment. 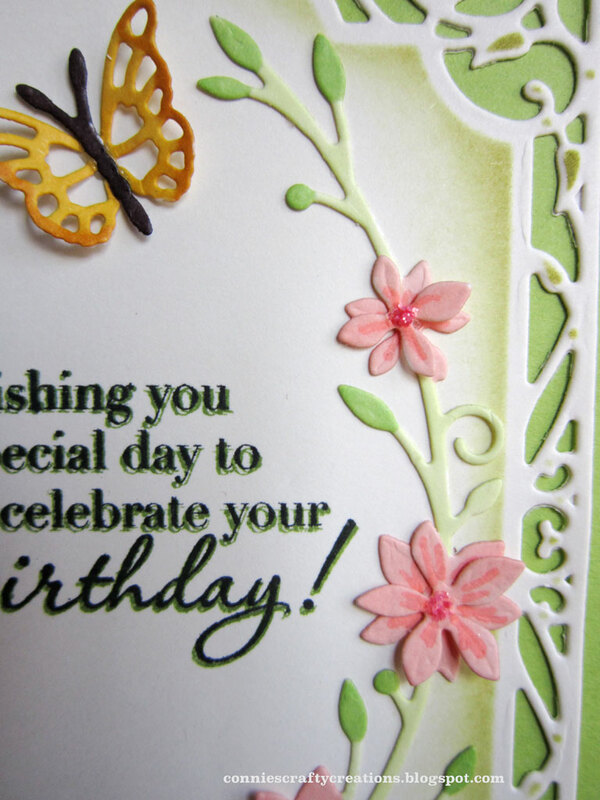 I started my A2 Size card with a Spellbinders A2 Divine Eloquence die for the framing of my card. Check out all your dies, some of them have openings that you can ink through the die and it stencils ink onto your card, and not only Spellbinders is doing this there are other companies now. The Memory Box Seraphine Laurel die I colored with markers, the die set comes with extra flowers, so you can bring dimension to your sprigs, isn't that pretty, I love when we can bring dimension to our cards, but still flat enough to mail with no extra postage. I also used the Memory Box Leavenworth Butterfly trio dies for my butterfly, they don't happen to sell this one anymore but I did a search for butterflies and you can see HERE all the great butterflies in the store. The sentiment is from Stampendous Birthday assortment stamp set and I also added Stickles in Warm Lipstick to the center of the flowers.. Here is a close up of the layering of the flowers. As you can see I tried the shadow stamping on the sentiment. Here is the set I used in today's card. Your card is beautiful Connie! I love everything about it, especially the frame die, your shading and colouring. The flowers are so pretty and make a gorgeous frame to the sentiment. I've never tried shadow stamping before, so will definitely be giving it a try! Oh Connie this is so, so pretty! Love the soft colors you chose and the shading showcases the die in such a beautiful way! Well done! The shading does add a nice touch..........I will have to add that to my "techniques to try" list. 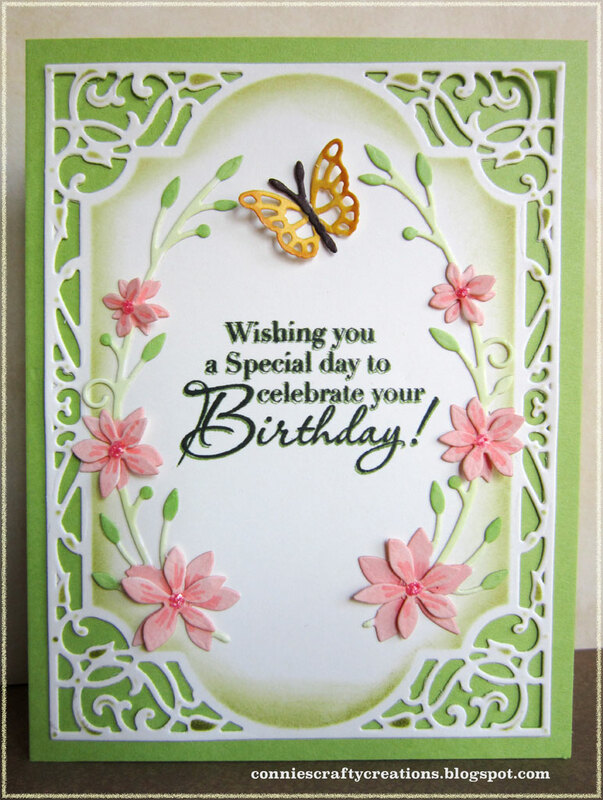 Beautiful card with lovely soft colors. Connie, that's so beautiful and delicate! LOVE it! I also love how you sponged the die, so pretty! Wow, this is gorgeous Connie! I too, am loving the sponging you did on the inside of the die. I love the look that gives and the frame is so delicate and pretty! This is such a stunning card!! Connie, this is gorgeous! 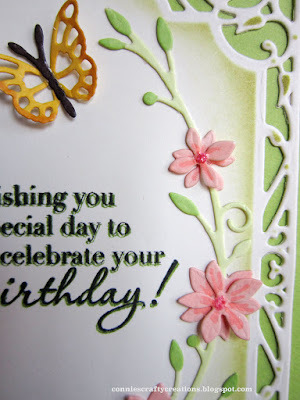 Done in my favorite color combination, with gorgeous dies, and so delicate! Love your card entirely!